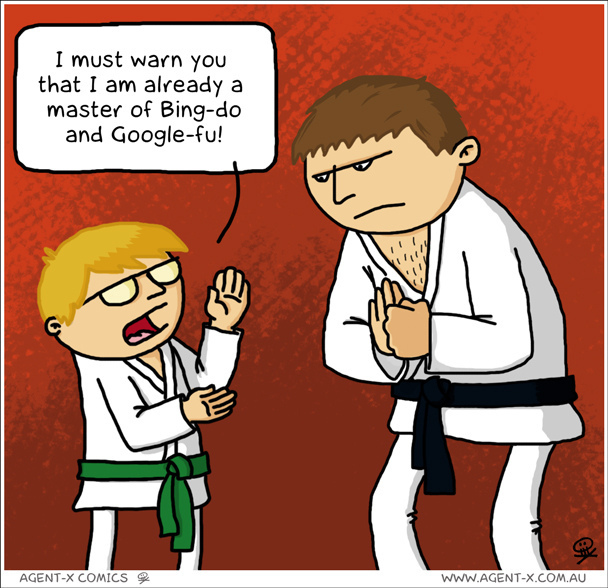 Google-Fu : (n) The art and science of crafting google searches to give you precisely what you need. Example : GoogleFu is strong in you. If your Google-Fu is strong, the sky is the limit for what you can find online. I have often found amazing resources with a few tweaks to an otherwise useless search. Free, electronic resources free for the taking - if only you know how to find them. First up is Google Advanced Search. If you use this advanced form, you can do all of what I'll show you in this post without having to type special stuff into the search blanks. The google advanced search form is a really user friendly form that allows you to search just about anything with easy, user friendly explanations off to the right of each blank. If you like google advanced search, add it to your bookmarks so that you can get there easily. Although google is capable of doing a ton of things and you can do all of them from the advanced search form, sometimes it's quicker for me to do google-fu in the generic search blank. Here are a couple search tricks that are at the top of my list for genealogy searches. Sometimes, you will run across a website that has a collection of pages or online books that are not indexed or searchable - or the search doesn't work well. Which is frustrating, when you know that there is data in the pages that could be helpful. Never fear... where there is google, there is a way! Go to a google search form. then enter a space and then open quotes, the search term you want to search for and then close quotes. So, for instance, if I wanted to search rootsweb for the name 'nancy norwood', I would type site:http://www.rootsweb.ancestry.com/ "nancy norwood" The quotes ensure that you get only Nancy Norwoods. Without the quotes, you would get all Nancys and all Norwoods, which can quickly get messy. The art of creating keyword searches is easy once you get the knack for it. But I've seen all sorts of really inefficient search terms. Google is a really huge 'place'. The more precise your wording, the better your results will be. For example : If I were trying to find a person who died recently who was named Nancy Norwood, I can type in "People who have died who were named Nancy Norwood" and I will get some mortuary, obituary and geneaology sites for Nancy Norwood. I've cast a broad net over all of the topics that have anything to do with death and Nancy Norwood and I'm going to get a lot of results that I just don't want. I get a full list of obituaries for people named Nancy Norwood. I could also try "nancy norwood" cemetary. Or "Nancy Norwood" death. I could even add the city to narrow it down further : "Nancy Norwood" obituary Chicago. However, adding the state might not be helpful. This query : "Nancy Norwood" obituary Chicago Illinois would give me Nancy Norwood obituaries in Chicago AND/OR Illinois. If You use an operator and require Chicago AND Illinois, you are likely to miss out on results that only say Chicago but do not say Illinois. If you're hungry for more or just feel like exploding your brain for the day, take a look at this guide to google. It's a relatively easy to read and understand guide - but it really does delve into the many, deep crevices available in google search. If you'd like something a little easier and geared towards geneaology, this book and cd : The Genealogist's Google Toolbox by Lisa Louise Cooke might be the hot ticket. Thanks for the great reading and ideas!